Our Chapter provides local networking at regularly scheduled meetings, programs that include speakers and tours of aviation facilities and landmarks, community outreach efforts to encourage young people to pursue aviation careers, and scholarship opportunities. Check out our Calendar, Outreach, Scholarship and Fundraising tabs to learn more about some of the wonderful events we host each year! 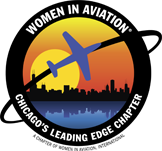 To become a member of Chicago’s Leading Edge Chapter, you must become a current member of Women in Aviation, International. Renewing your international membership serves as a renewal of your Chapter membership. To become a member of Women in Aviation, International please click here. This will allow you to enjoy the many benefits of both our chapter and WAI with one membership fee. Once you have become a member of Women in Aviation, International simply fill out a Membership form and email, mail or bring it with you to a future meeting, then enjoy the benefits of membership! For more information contact Membership or to email your membership form to our Membership Chair, please email chicagosleadingedge@gmail.com and welcome aboard!